Pellerin Milnor is pleased to introduce its newest dryer line – the Premier Series Dryers. The Premier Series is available in three sizes, including the 50 lb (23 kg) capacity M-50p, 80 lb (36 kg) capacity M-80p, and 120 lb (54 kg) capacity M-120p. All three models are offered in gas, steam, or electric heat. The series is equipped with an intelligent and simple to use control system, stainless steel baskets and fronts, a reversing basket, double pane glass door, and fully insulated cabinet. The Premier Series also features the Sensor Activated Fire Extinguishing System (S.A.F.E.). 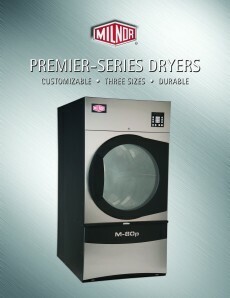 For more information on the Premier Series dryers, please call 504-712-7656 or visit www.milnor.com.